Socialization is crucial for companion parrots because if not for what we teach them, they're wild birds. All too often a parrot will bond to its caretaker or someone in the family and then be aggressive toward everyone else. If you think about it, this makes sense. The parrot gets everything it needs/wants from this individual while everyone else is erratic, unpredictable, and possibly dangerous. Guests, visitors, and strangers are possibly the worst people from the parrot's perspective. At worst they come and invade their territory, scare them, and make them feel helpless. At best, they leave them alone while diverting their owner's attention away from the parrot. Either way, there is nothing to be gained by the parrot and everything to be lost so it's not a wonder parrots typically don't like company. This is why socialization through a positive reinforcement approach is essential. Here I will outline the steps I take with my birds and suggest you do with yours when introducing any new people. First, never take the parrot's tameness for granted. Just because it steps up for you and doesn't bite (if it does, you're going to have to go back to basics before introducing others) does not in any way mean that it will behave this way towards strangers. Hopefully the parrot has a history of training and positive reinforcement from you which gives it reason to be around you. Or perhaps it's just used to you and nothing else. Regardless, don't take this for granted and invite others to handle your bird straight out because most likely this will result in failure, bites, and worst of all encourage your parrot to be aggressive towards people. 1) Ignore the bird. More importantly have your visitor ignore the bird. The worst thing that could happen is your visitor gets excited that you have a parrot and goes straight to the parrot cage upon entry. The parrot doesn't know what to think of this but is safer to get defensive than wait to see what happens. Even if the parrot doesn't get a chance to attack your guest, it will still develop a bad first impression that this individual is potentially dangerous. So instead, it is best to pretend the parrot doesn't even exist for the first 10-60 minutes. The visitor should avoid eye contact or walking straight toward the parrot. Otherwise the visitor should just go about things as though you didn't have a parrot at all. I usually tell people that I'll show them the parrot later but for now something else. This shows the parrot that the guest is harmless and avoids setting a bad impression. This gives the parrot a chance to watch within the safety of its cage without feeling trapped by an approaching stranger. 2) Let the bird loose. Let the parrot out of the cage and choose whether to approach or not at its own pace. Again, don't allow the visitor to impose upon the parrot. Ideally the parrot should be flighted and given the chance to fly closer or retreat at its own comfort level. Most likely in no time it will approach out of curiosity or come to you for security. By letting the parrot set the pace rather than the guest, it's guaranteed that it won't have reason to be terrified. 3) Show how to handle parrot. You must realize that most people have never handled a parrot before and don't know how to. Even the ones that have still probably don't know how to handle your parrot so assume you must start from scratch with anyone. This is best because then the way guests approach your bird will be similar to how you do and familiar. Show your visitor how you approach the bird, how it steps up, how you pet it, etc. Don't give people the opportunity to treat your bird like a dog or child. They have to understand that this is an intelligent free willed animal deserving respect and admiration. 4) Human perch. Let your visitors first contact with the bird be as nothing more than a human perch. Guide your visitor into holding their arm or finger out to accept the bird and do nothing else. NEVER let them just reach in and have the bird step up. You can't be sure what they'll do and the bird especially. Many times this will result in a nasty bite but if nothing else, will assure the bird that it's safest to just avoid strangers all together. It's a great idea to target train your parrot beforehand and then use the targeting method to target the parrot onto your visitors hand and then back off. Again, remember that the first time on someone's hand should be uninvolved. The person should not pet or handle them yet. Showing the parrot that it can stand on random people's hands without anything happening is far more reassuring than something unpredictable going on. If the bird doesn't target or is well capable of going on other people's hands, just put the parrot onto their hand. Use your hands to keep their attention and deflect a potential bite. Don't give an opportunity to either visitor or parrot to get scared. If one gets scared, the other is sure to become scared too and ruin everything. A scared, biting parrot will make a human scared; by the same token, an unsure human will scare the parrot into biting. 5) Tricks. The bird should be trick trained beforehand. This is yet another reason why trick training is so useful. Have your visitor cue tricks from your parrot and reward it with treats. This is fun and exciting both to visitor and parrot. Allow the visitor to present bigger treats or the best ones you refrain from using too much. This will help the parrot overcome the unfamiliarity and even look forward to visitors instead of dreading them. This is a fun, safe, hands off approach to use positive reinforcement with the parrot for socialization. 6) Step Up. Only after going through the prior steps do you actually allow a new person to request the parrot to step up. What we did was build a certain level of trust in the bird before having someone actually move their own hand toward it. By the time you think it's appropriate for a visitor to approach the bird for step up, the bird has received good things and nothing bad so it's worth a try. My preferred way for having my parrots step up for visitors is by surrounding the bird with tricks..My parrots are accustomed to receiving treats after performing a trick. Thus I have the visitor cue a trick, then while approaching with the treat, ask the parrot to step up to get it. The parrot already knows it earned a treat so it might as well step up to get it. This gives the parrot less reason to doubt motives. After a few successful step ups as such I switch it around. I have the visitor get the bird to step up first for the opportunity to preform a trick for a treat. Thus the parrot learns to simply always step up to earn potential opportunities and not exclusively when a treat is in the hand. Again, it's good to go through these stages with your parrot yourself before completing them with visitors so that the parrot knows what to expect. 7) Petting. Now that the parrot is comfortable being on hands, we can introduce hands for petting. Remember that people don't know how to handle or pet a parrot so you must show them the way your bird likes it. This is not a time for experimental petting. If your bird won't end up liking it then it will avoid allowing people to do it in case it's bad like that again. I have my parrot perch on my hand and hold its beak between my fingers. This teaches it a submissive pose, puts a buffer between biting guests, and it tells it what's about to ensue. I begin by scratching my bird's neck the way it likes and then having the guest reach in and join together. Then I take my hand away and allow them to continue. Since the parrot was enjoying it from the start and the visitor did nothing more than continue it, the parrot allows it and even enjoys it. This creates a reason for the parrot to look forward to visitors and not dread that they will manhandle it in some terrifying way. 8) Bird Potato. Play bird potato with one or more guests by randomly passing the parrot around between people and handling it. Mix tricks, scratches, step ups, and breaks randomly so the parrot just becomes accustomed to as many people and hands as possible but always keeping it desirable for the parrot. 9) Grab training. Teaching the bird to allow itself to be grabbed by different people is not only useful when that needs to be done (grooming, vet, boarding, emergency, etc) but also builds a greater level of trust. If the bird will trust someone to grab it and not bite, then it will especially feel safe and not bite just standing on their hand. At first this process may take days or weeks so work with someone familiar but eventually the more people you follow these steps with the easier and quicker it will go. Have the visitor come as close to the bird as it allows and give a treat. Then the visitor should progressively bring the hand closer to the bird without touching and then give a treat. Eventually the visitor should be able to touch the bird for a treat, cup it, and finally grab it for a treat. In the long term have visitors grab and carry the bird to other parts of the room, grab it on/off the cage, and give treats and mixed intervals. The parrot will just become accustomed to being handled by people as a normal activity. Repeat the above steps with as many people as possible at home. Once the bird is ok with at least a few people you can begin trying the next approaches. 10) Private Outings. Bring the parrot on private outings with not too many people. Take the parrot to dinner with family, over to a friend's house, etc. Start with smaller events that can be controlled before going to things that are more bustling. These are great opportunities for the parrots not only to meet new people but also to become more at ease with people they already know. My parrots can get more bossy at home but when out they are much nicer to other people. This is a good opportunity to continue the socialization process and mend bridges. People that were previously enemies can become friends in unfamiliar places. 11) Public Outings. Once the parrot is used to some people and places you can begin taking it on outings to public places. Parks, malls, streets, carnivals, etc are all great opportunities for your parrots to learn that people are harmless and good. Inevitably people will want to handle your parrot and they will be willing to listen and do as you say. This is your chance to guide the interaction as you have done at home and ensure that interactions with other people will always be good. Since the parrots are busy taking in all the activity of being outside and not within their own territory, they will be less likely to protest. Since humans have always been a safe thing before and the new unfamiliar ones are being presented in familiar ways, the parrot will cooperate. Again it is your responsibility that the parrot does not bite or scare people and vice verse. However, successful public outings like this will make your parrot infinitely more robust and social towards people and changes in their life. 12) Uncontrolled Random Interactions. 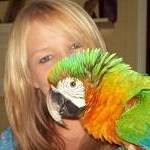 It's inevitable that at some point or another someone will handle your parrots not in ways that you would recommend. Most likely this has already happened previously and set things back a lot. Well once you reach this last stage, it should be ok for this to happen sometimes. Ensure that the parrots are not hurt but as long as it's not harmful, allow people to handle them in random unpredictable ways. Every now and then someone will just run up and touch my parrots at the park or pet them in ways I wouldn't recommend. But the parrots realize that this is harmless and get over it. If you always shelter your parrot from this, then of course these unpredictable interactions will be terrifying. But once your parrot is already well socialized, allowing some of these to slip by now and then just makes them more robust and prepared to deal with things you could never have foreseen to prepare them for. Great article! This makes a lot of sense, and is going to be really helpful with all the people I have visiting this summer. [quote="Lifegod":3qq9rs74]Thanks for this! Still trying with my Senegal. He's a mean little turd who likes to bite everyone including me It's especially heart breaking when he bites my Grand kids who only want to pet him or give him a treat... Very frustrating...[/quote:3qq9rs74] We have a bird who is super social and calm around guests. She lands on their knee, hangs out there. We travel with her to family gatherings but the only person who can universally pet her is my girlfriend. Children tend to have fidgety unpredictable movement that make parrots nervous. I'm in no way surprised that they weren't keen to be pet by your grand kids. It takes a while to earn a birds trust. What would you do if a bird flew straight to the guests when they arrive, sat on their shoulder for a short period and then bit their ears after not receiving attention?